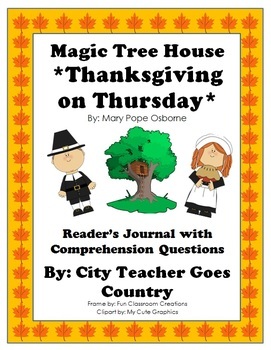 Reader's journal and comprehension questions for each chapter of Mary Pope Osborne's book, Thanksgiving on Thursday, Magic Tree House book #27. Included are 14 pages for the journal and 2 pages for the answer key. Some questions are open ended, some multiple choice, true and false, or even a drawing answer. Uses context clues, inference, and general understanding and comprehension as they read. 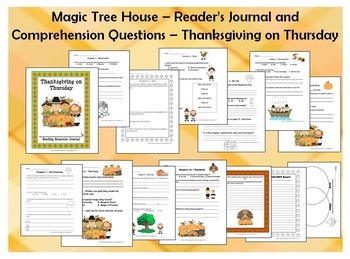 Can be used in guided reading, literature circles, novel study, or to check comprehension after reading aloud. Many different options. Be sure to leave feedback with any purchase to receive TPT credits to spend. Also, don't forget to become a follower to get sales updates. Clipart by Scrappin Doodles, My Cute Graphics, and Creative Clips.